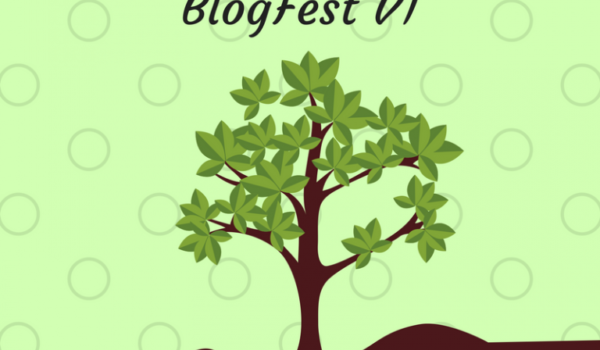 Originally published on Medium. 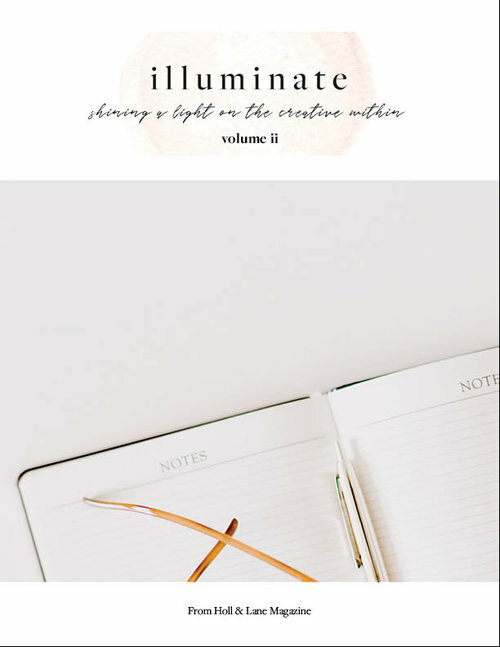 Featured in illuminate vol. 2. I am so tired of hearing these things. They are all well meaning efforts at empathy, but every one of them grates on me like nails on a chalkboard. It’s not that I don’t understand what the person uttering these words is trying to say. It’s that they don’t understand my pain, yet they feel compelled to say something because no reaction would be taken as heartless and uncaring. Read the full article. 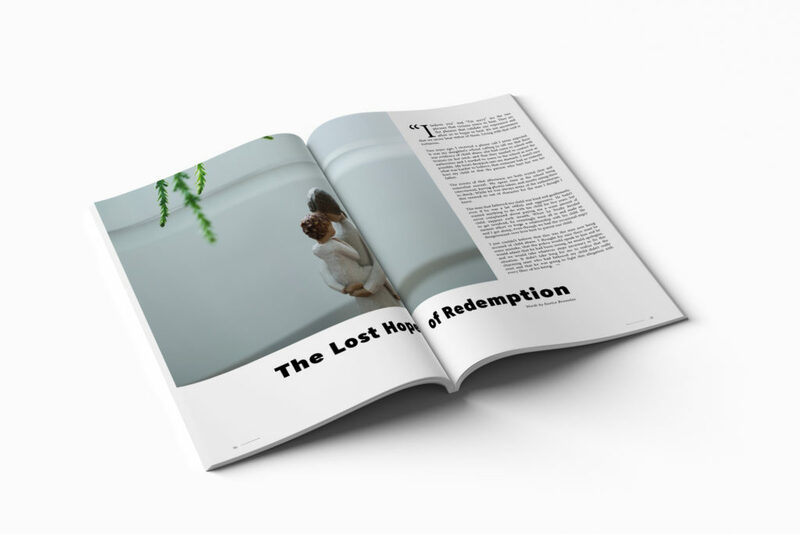 This article was written for Holl and Lane Magazine Issue 19: Redemption. Read the full article on page 70. “I believe you” and “I’m sorry” are the two phrases that victims yearn to hear. They are the phrases that validate our experience and allow us to begin to heal. It’s not uncommon that we never hear either. Living with that void is torturous. I will never hear those words. Through the entire process, I have been vilified at every turn. 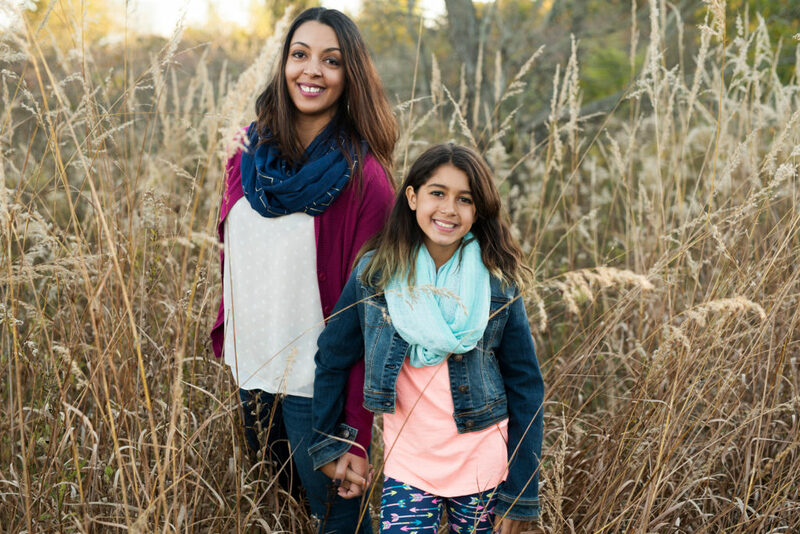 I have worked hard to protect my child from the lies, the anger, and the manipulation. It is only thanks to his insistence on making this about me that I have been able to keep her safely away from him. I know that none of what I have been fighting against is my fault. I know that the stories I hear are untrue. I know that the efforts to twist my intentions into something negative are only to give cover to the real villain. I know that the things that are said about me and the feelings that are directed toward me are all a result of the lies that have been said. 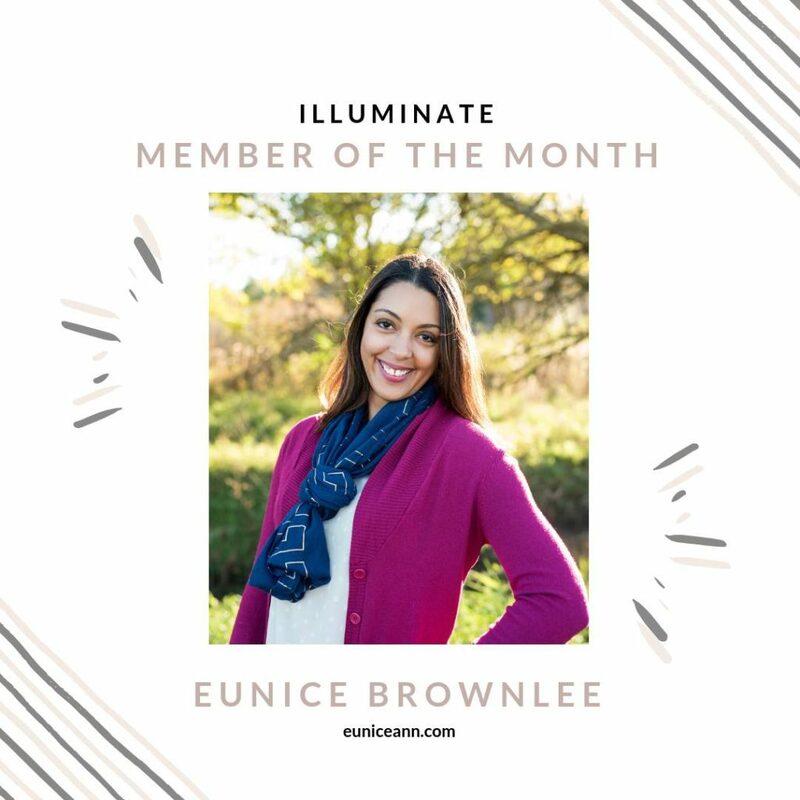 As a member of illuminate, I was honored to be listed as a featured member in January 2019.
illuminate is a sister brand to Holl & Lane Magazine and is dedicated to helping women of all backgrounds and talents find their voices in writing. This article was originally published on Medium, then re-published on the Holl & Lane Blog. Because we’re taught as children to ignore it. Read the full article. This story was inspired by a prompt on “Growth” from illuminate. Read the full story, selected for publication on the Holl & Lane Blog. I’m not sure just how many acres we covered that summer, but when I think back on the time my dad and I spent in the woods, I think less about the scratches on my limbs from the locusts, or the weight of the backpack, or the taste of the horrible protein bars we brought with us for energy, or how tired I was from hiking around for eight or ten hours. I think about all of the beauty that surrounded us each day. 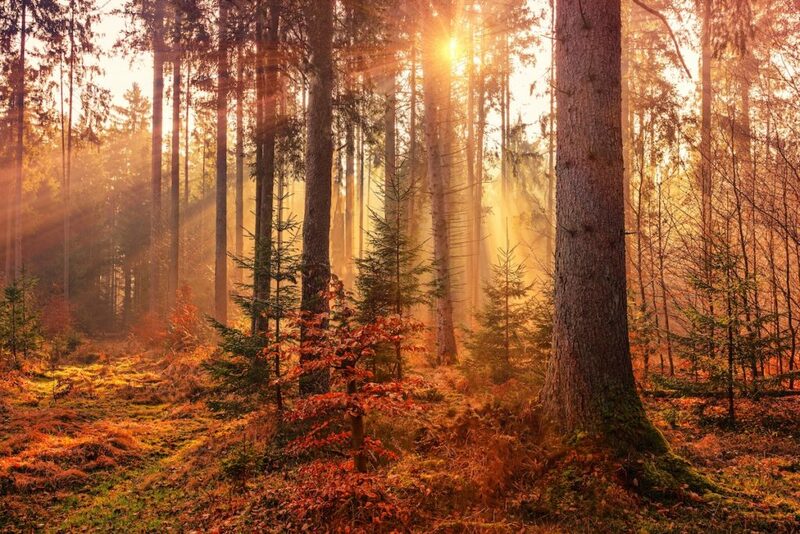 I remember the little seedlings that were popping up from the forest floor and how it killed me that we always had to cut the smallest one. It never seemed fair that one of them had to be sacrificed in the name of science while all of the others continued to grow. 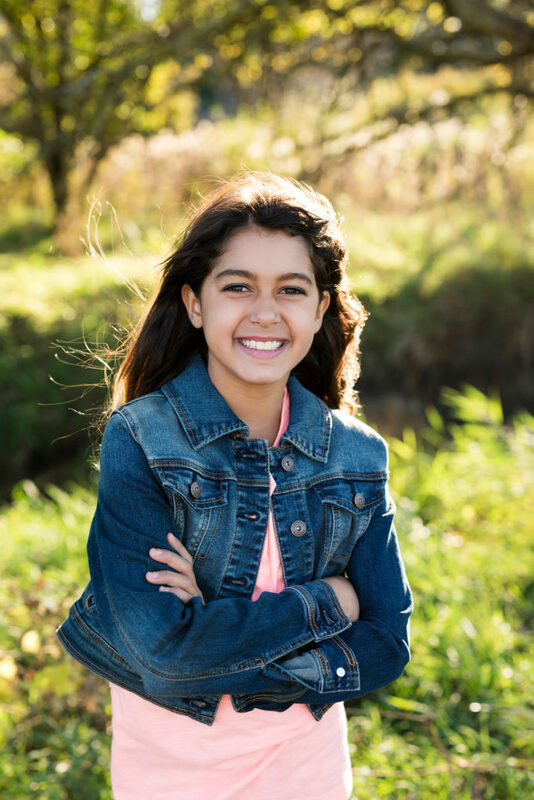 It reminded me of all the children that never make it to see their first or fifth or tenth birthday, and how it doesn’t feel like part of the natural order of things for a parent to lose a child. I was able to see the beauty in the thought that although the little ones had a short life, their time was necessary and their death was important. This article was written for Holl and Lane Magazine Issue 18: Impact. 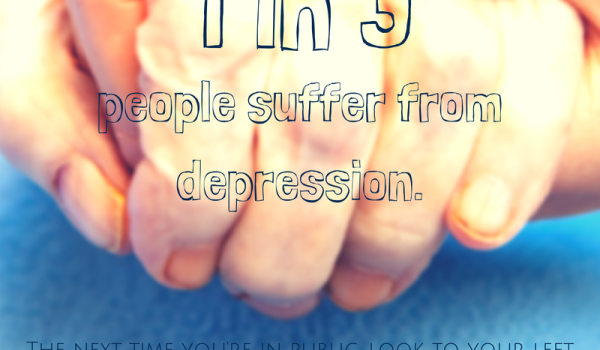 Read the full article on page 56. I’ve been involved with Habitat for Humanity since I was a kid. My dad was actively involved in our local chapter growing up and I went on my first build when I was 16. When my church sponsored a build when I was 28, I knew I would participate from the moment they broke ground. I signed up for every volunteer shift I was available for to work on that house. I didn’t expect that volunteering for that particular build would open up a whole new opportunity to impact so many lives in such a profound way. I can honestly say that I don’t remember much about the family my church sponsored but as I hung drywall, built shelves and painted, I saw this plot of land transform into a house. When I attended the home dedication a few months later, I watched as four families put down roots in our city and knew that because of my work, their lives were forever changed. After that build, I volunteered on a few more build sites, I brought hot chili to build crews on cold winter days, and then an opportunity to become a home interviewer came up. I had no idea what I was getting myself into. I will never forget my first home interview. 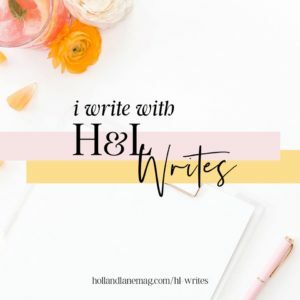 This excerpt is from a post written for and published on the Holl & Lane Magazine Blog. I watched the other girls get roses in their lockers and walk down the halls with their fingers intertwined in his, laughing and smiling and kissing. I watched the cute boys throw themselves at these girls until they were the lucky ones selected by the princess to be her knight in shining armor. I went to school dances, hoping to hold someone around the neck with his hands placed gently on my waist while we swayed awkwardly to the slow beat. I sat and watched other girls getting to enjoy this and I hoped one of those boys would ask me to dance. No one ever did. I had plenty of friends, girls and guys alike. They all thought I was nice. They all knew I was smart. But nice and smart weren’t getting roses in my locker or candy-grams with cute messages delivered to my classroom. I wanted to be like the other girls and I believed I had to be beautiful to get it. 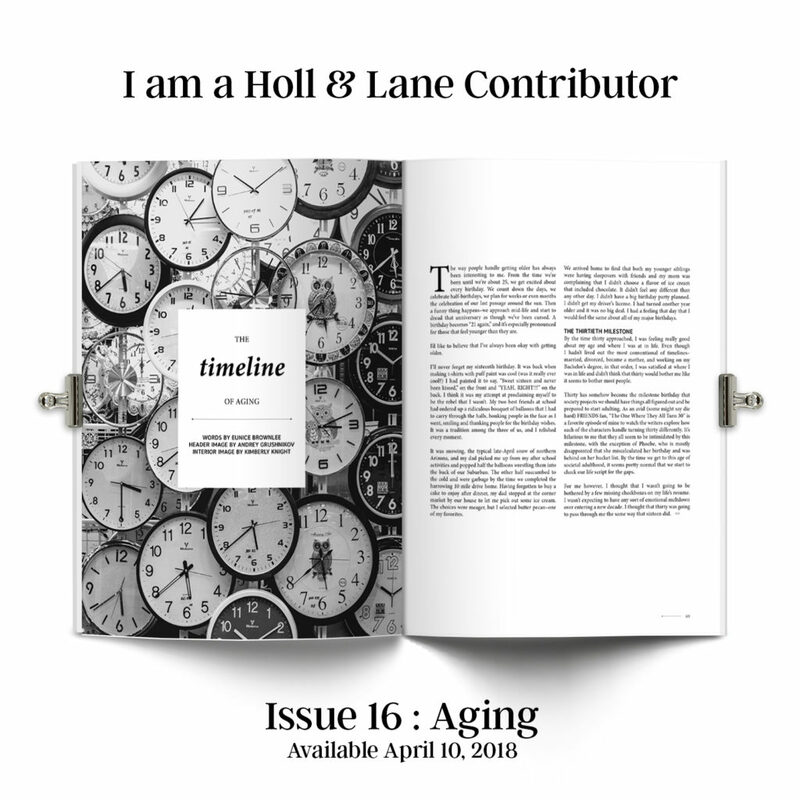 This article was written for Holl and Lane Magazine Issue 16: Aging. Read the full article on page 68. The way people handle getting older has always been interesting to me. From the time we’re born until we’re about 25, we get excited about every birthday. We count down the days, we celebrate half-birthdays, we plan for weeks or even months the celebration of our last passage around the sun. Then a funny thing happens–we approach mid-life and start to dread that anniversary as though we’ve been cursed. A birthday becomes “21 again,” and it’s especially pronounced for those that feel younger than they are. I’d like to believe that I’ve always been okay with getting older. I’ll never forget my sixteenth birthday. It was back when making t-shirts with puff paint was cool (was it really ever cool?) I had painted it to say, “Sweet sixteen and never been kissed,” on the front and “YEAH, RIGHT!! !” on the back. I think it was my attempt at proclaiming myself to be the rebel that I wasn’t. My two best friends at school had ordered up a ridiculous bouquet of balloons that I had to carry through the halls, bonking people in the face as I went, smiling and thanking people for the birthday wishes. It was a tradition among the three of us, and I relished every moment. A few weeks ago, I took my now 11-year-old to a girls’ craft & create night. I ran into a friend I haven’t seen in awhile, and after I greeted her with a hug, my daughter formally introduced herself, handshake and all, to my friend. It was a seemingly normal event in my book, as my daughter regularly interacts with adults in such a manner. Yet my friend was completely taken aback. “Oh my gosh, she’s amazing! I have never seen a child her age interact with a complete stranger with such confidence!” my friend exclaimed. A new mom herself, my friend expressed her desire that her daughter would some day be the same way. I couldn’t exactly tell her how to do it, because even I wasn’t so sure how my kiddo found her charisma. It’s taken a lot of interactions that resulted in responses like this to realize that my kiddo isn’t normal—in a totally good and amazing way. It got me thinking about how the heck she became such a strong and independent young woman at such a young age. I realized that strong women aren’t born. They are made. But when I think of what it takes to have the kind of tenacity and resilience that makes us strong, I think of overcoming failure, heartbreak, and trauma. All of my favorite women of history have their moments where they overcame adversity to find their strength. It’s the classic hero storyline.